Born at St. Isidore, Quebec on 23 August 1855, son of Francois Théophile and Pamela Racicot Langevin, his father was a near relation of Sir Hector Langevin, and his mother was sister of the Right Reverend Zetique Racicot, Bishop of Pogla. He was educated in Montreal at Montreal College, the Sulpician Grand Seminary, and St. Mary’s College. He joined the Order of Oblate Fathers of Mary Immaculate in 1881, and was ordained to the priesthood in 1882. He taught for eight years at the University of Ottawa. 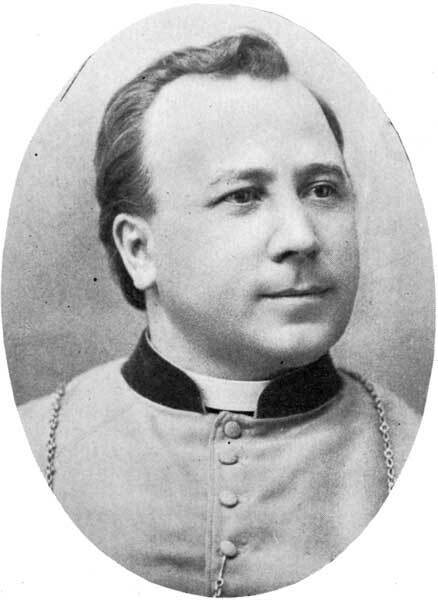 Langevin came to Manitoba in 1892 on the invitation of Archbishop Taché to become Superior of the Oblates in the Archdiocese of St. Boniface and Rector of St. Mary’s Church, Winnipeg. In 1895 he was raised to the See of St. Boniface made vacant by the death of Archbishop Taché. He took a prominent part in the Manitoba Schools Question. It was at his instigation that the St. Boniface Historical Society was formed in 1902. He administered the Archdiocese of St. Boniface for twenty years. In 1911 he published a religious analysis of the Diocese of St. Boniface, Mémoire confidentiel sur la situation religieuse . . . de Saint-Boniface. He died in Montreal on 16 June 1915, and is commemorated by Rue Langevin in the Saint-Boniface area of Winnipeg. He was succeeded as Archbishop by Arthur Beliveau. Louis Philippe Adelard Langevin, Dictionary of Canadian Biography XIV, 597-601.